April 14 was a busy day for the USPSA club members at the raccoon hunters. About a dozen people showed up with tools in hand to prepare for the 2012 shooting season. The response to the new walls (and stands that hold them) was positive last year so a new batch of walls with the same design were built. The design uses a heavy duty screen along with a bright orange mesh to allow ROs and observers visibility down range. The screening is heavy enough to stop most splatter from steel while allowing the wind to pass through. Building walls of this type is far less expensive than the solid walls previously constructed allowing the club to build many more than previous years. Most importantly, more walls and durable stands allows Roy, Rob, and Brian to build stages with fewer barrels. Barrels will not be eliminated entirely but shooters can expect fewer wind/barrel delays this season. Another group concentrated their day to repairing steel. The steel targets have a few years of heavy use behind them and were in need of some care and maintenance. Everything from hinges to the wooden bases were looked at on every piece of steel owned by the club. When possible, targets were repaired on site. Steel that was beyond minor repair was inventoried for incremental repair or replacement through the year. Setting up should be easier this year as the storage unit was emptied, cleaned, and restocked in a way to maximize space while allowing storage of the many new walls and stands. With a little effort after matches and practice sessions the storage unit should be kept organized for the season. Members have discussed moving to an electronic scoring system for a few years. Brian and Rob work very hard after a match to enter scores by hand from paper into the computer for upload to USPSA. Even with 70-80 shooters a match, the guys have done an amazing job getting scores in to USPSA the day of the match. That will be an easier task this year as a very generous member purchased a complete scoring system for the club’s use. 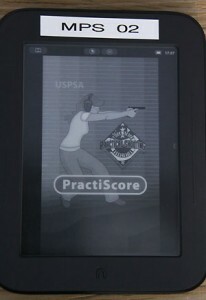 The new system uses the PractiScore software from MGM Targets and Nifty Bytes and operates on the Nook. This will allow for even faster upload of scores after a match and decrease the number of issues experienced with the two sided paper scores. The PractiScore will work on any mobile device with iOS or Android. A few shooters already use versions of this to keep track of their scores during matches. So, with more walls, fewer barrels, functional steel, an organized shed, and electronic scoring; this is going to be a great year for pistol shooters at the raccoon hunters.